Consumers expect greater accessibility, service and connectivity, and companies are learning that they need to bolster their tech infrastructure and streamline their ops to remain relevant. IT managers who embrace new technologies such as cloud, big-data analytics, the rapidly-expanding Internet of things (IoT) and mobility are leading the way: these elements boost business efficiency and performance. However, integrating them into outdated enterprise networks can limit their benefits. 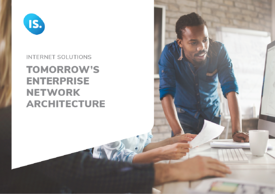 In this guide, we will explore tomorrow's enterprise network architecture by outlining hardware and software changes that power business connectivity.